Hello, everyone! It's so great to have you join me today! I hope your summer is going well! My summer is going too fast for me, but I do love summer and I try to grasp every bit of it! It's been a busy week here. We've had family visiting and it's been a great time. But, that explains my lateness in posting my tag for this week's Summer of Color challenge. So, this post will be brief. The colors for this week were gray and lavender with a pop of plum. The gray and lavender were not easy colors for me to work with. Honestly, they always make me think of Victorian ladies coming out of mourning. But, I decided that was a downer so I was going to go with my favorite subject, Gardens! Victorian gardens to be precise because I couldn't get away from the Victorian vibe! I started with a number 10 tag and covered the whole thing with Weathered Wood Distress Stain. I then ran a line of Brushed Pewter DS along the edge. I daubed some embossing ink on a piece of bubble wrap that was sitting on my table and randomly pressed it onto the tag. I used Ranger's Antiquities embossing powder in Cement and heated it. I then pressed the bubble wrap over parts of the embossed areas and embossed again with silver embossing powder. The image of the lovely Victorian lady was from my stash and is a fabric piece that I glued in place. I used part of a Memory Box die cut in a lavender paper to frame her and give the illusion of her looking through a garden gate. 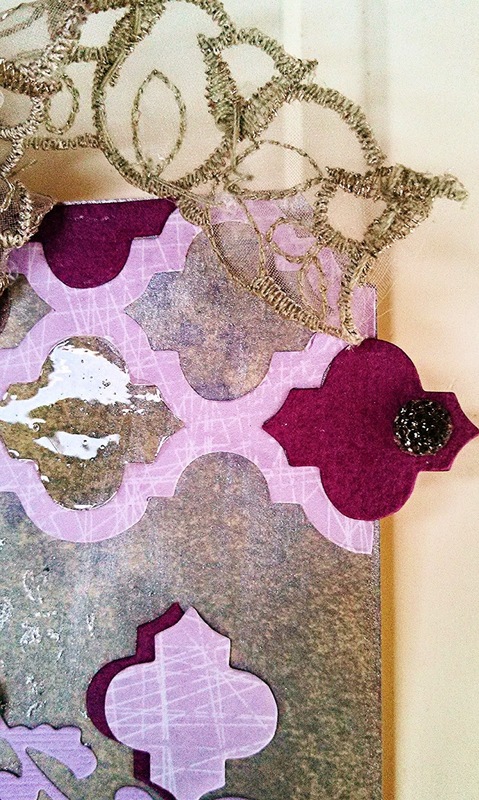 One of my favorite dies are the new Tim Holtz trellis dies. I used a different lavender paper to cut them. I then used a plum paper to cut another trellis and used the inner pieces for my "pop" of plum color. I used Glossy Accents to fill in some of the openings and the plum pieces to fill in others. One of the things I love about these dies is that the inner pieces can be used alone and I love using two colors together as a shadow. You can see I scattered those around the tag. 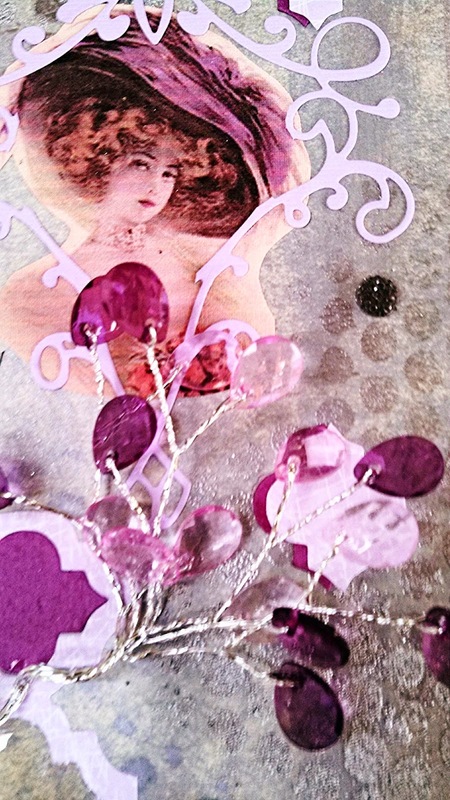 I glued a spray of lavender and plum "berries" below the focal and added some Kaiser Craft Sparkles to the background. I finished it off with a piece of sequined lace trim from the stash. So, there is this week's tag! In the end I had a great time using these colors which is why I love this challenge. Thanks once again to Kristin for hosting and for coming up with such fantastic color combinations every week! ﻿Thank you all for visiting me. I so appreciate your visits. I hope you have a fabulous weekend and I'll be back soon. Aaaaaaah, Maryanne! You did it! You used these colors absolutely beautifully to create your amazing tag! I really like how you used the glossy accents here. You are so creative, my friend. I hope you are having a great weekend so far. And thank you SO MUCH for always leaving the nicest comments over at my blog! HUGS!!!!! A beautiful tag Maryanne :-) I love the image and wonderful texture and details that surround her. Super tag with lots of intricate details. WOW! I love this - very Victorian and very pretty. That sequined lace is just over the top gorgeous. This is so pretty, Maryanne! Love the sweet Victorian color palette. Your background is gorgeous and so is the vintage image. LOVE the ribbon topper too! Your tag is beautiful! I really enjoyed reading about your techniquest too. Oh I love your elegant lady! Such a sweet and elegant tag - I do love what you've done with the colours and the image you've chosen is gorgeous.